Amy has been personal training since 2005. After years in other people’s gyms and working in research at Washington University in St. Louis School of Medicine, she created Elevated Fitness, LLC. Amy saw the need for a different type of fitness professional in Clovis - someone to get and keep a wide range of participants motivated in a non-threatening environment. The confidence and camaraderie that her clients and boot campers gain from becoming more active helps boost their adherence to a workout regimen. She is happy to provide fun and challenging workouts to all who participate in Clovis, NM, at Cannon AFB and via the web. Amy recognizes the importance of a healthy lifestyle because it hasn’t always been easy for her to come by. Nearly twenty years ago, Amy was diagnosed with Ulcerative Colitis (UC). UC is a hereditary disease which may be catalyzed by environmental factors, and a chronic condition with which she will live for the rest of her life. Amy has been able to manage longer periods of remission from UC by maintaining a healthy lifestyle. Her dietary focus is on lots of whole foods (veg/fruit/grains), lean protein, and minimal processed foods. Exercise is an important commitment for Amy, too. Staying active helps keep her immune system kicking, the key to staving off a UC flare-up. Amy likes cross-training through a variety of activities and incorporates weight-lifting in her weekly regimen. 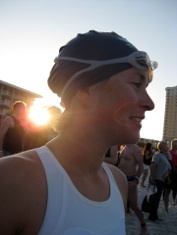 An avid endurance athlete, Amy completed her first full ironman in 2011. These days, she does most of her running chasing down her toddler, and tries to balance a healthy lifestyle and fitness goals with motherhood. Although she will likely never be able to give up her daily meds, Amy cannot begin to count the ways that exercise and proper eating habits have changed her life. She is so thankful for the opportunity to positively influence others through personal training and group fitness. For details on Amy’s professional qualifications, click here. Due to her husband's career, Amy has moved from Clovis. But you can still reach her for distance training and consults via the email and phone number below. For local training and High Plains Boot Camp, please contact Meryl or Sam, our two fantastic trainers. Read more about them below.